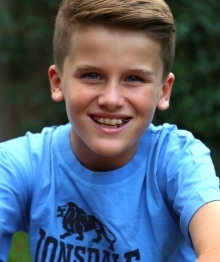 Ben Hessell was born in 2005 and has been doing voice over work since he was 3 years old. Ben listens well to direction and has good acting ability should that performance be required. He also has clear diction. Ben has done numerous Radio and TV commercials as well as character VO’s for online games. In his spare time, Ben loves his Rugby, Surfing, Skateboarding and hanging out with his friends. Ben has a great personality, is a fun kid to be around and enjoys having a laugh.